Forester Wins SUV of the Year Again in Russia. What were the 4 reasons why readers chose Forester? For the second year in-a-row, the Subaru Forester wins the “SUV of the Year” award in Russia. In the mid-size crossover category, the Forester wins the hotly contested award from the Russian magazine,Club 4X4. General Director of Subaru Motor in Russia, Yoshiko Kishimoto, accepted the award from the president of the Club 4x4, Mikhail Snarskii this week. Every year, the best choice is chosen by two juries. The "Professional Jury" consisting of the magazine editors, and "a Grand Jury", readers of the magazine. The contest covers eight categories of vehicles, from Full-size SUVs, Mid-size SUVs, Compact Crossovers, Subcompact Crossovers, Pickups, Universal Terrain, Premium Class and Premiere of the Year categories. The new Subaru Forester wins the "SUV of the Year 2016" again in one of the most popular categories, "Mid-size SUV." There were more vehicles in this category than other with 44 cars competing for the top honors. Readers gave four reasons they chose the Forester SUV over any other vehicle in the mid-size segment. Forester is functional and practical, and provides comfort on long journeys regardless of driving style. The SUV also has the necessary equipment that is suitable for off-roading. These are Forester’s attributes that have made it Subaru’s best seller not only in Russia, but also around the globe. 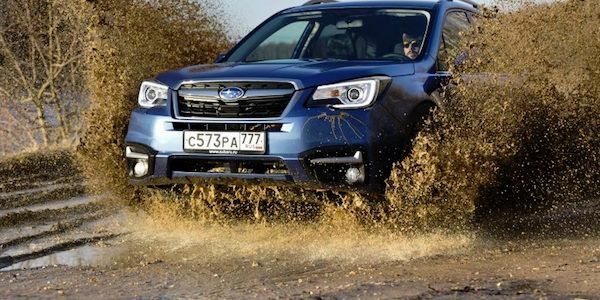 All-wheel-drive off-road enthusiasts in Russian think the new Subaru Forester is the best in its segment.